Every fall I am reminded that I really love polar bears! 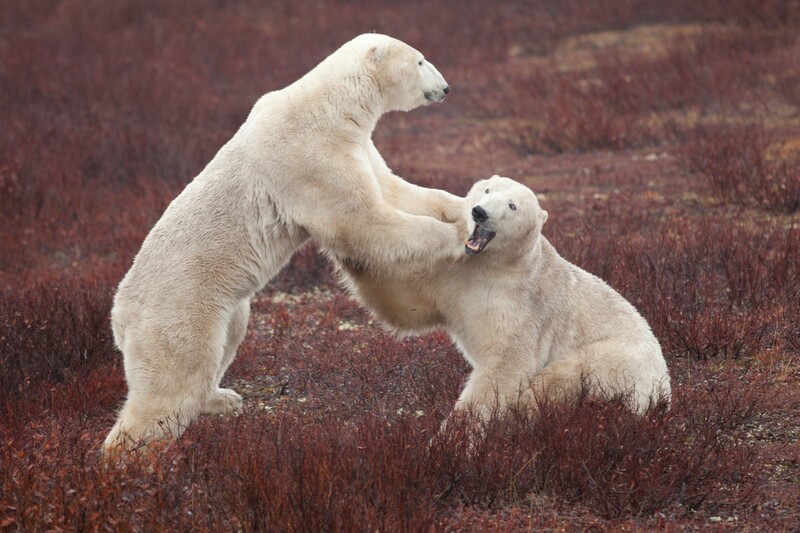 Each and every fall, as a cold snap in the air crosses North America, I pack my warm boots and parka and head northward, returning to one of Nat Hab’s most important locations—Churchill, Manitoba, Canada, where polar bears wait for winter’s freeze to start their hunting season. This may sound weird, but all year long polar bears casually enter my mind. After all, we’re planning our polar bear trips and booking guests on a daily basis, even during the heat of the summer. Plus we’ve got photos of polar bears scattered around our Boulder, Colorado headquarters, and I even have a few pictures of me with bears in the background inside my own windowless cave of an office. But it’s only in the fall, when I take the time out of all that desk-bound company-running stuff and fly via Winnipeg to this tiny tundra outpost on the west coast of the Hudson Bay, that I truly internalize just how cool these animals are…and how much I admire them. This year I joined a scheduled trip from beginning to end, so I had the rare chance to witness the bears just as our guests do. Our Expedition Leader—Dr. Court Whelan, whom I work with in our office on a daily basis in his capacity as our WWF Conservation Travel Manager—ran it as a regular departure and treated me like a regular guest. And I loved it! Our group on the Rover, photo by NHA guide Brad Josephs. Joining us were two father-and-daughter teams (one who were professional photographers and who shared their remarkable images, and the other who tended to drink beer at lunch, which made it okay for me to join in) and a father and son from New York who had taken trips with me previously and who had become my close friends. We also had an online travel professional from Australia, an FBI agent, a Finnish bear biologist, a botany professor (who joined in on those lunch beers! ), a computer programmer who invented the remote order-taking device at drive-through fast-food restaurants, and an octogenarian woman from Wisconsin who was a Detroit police officer in the 1940s and went on to also work for the FBI. She may have been the coolest person I have ever met in my life. 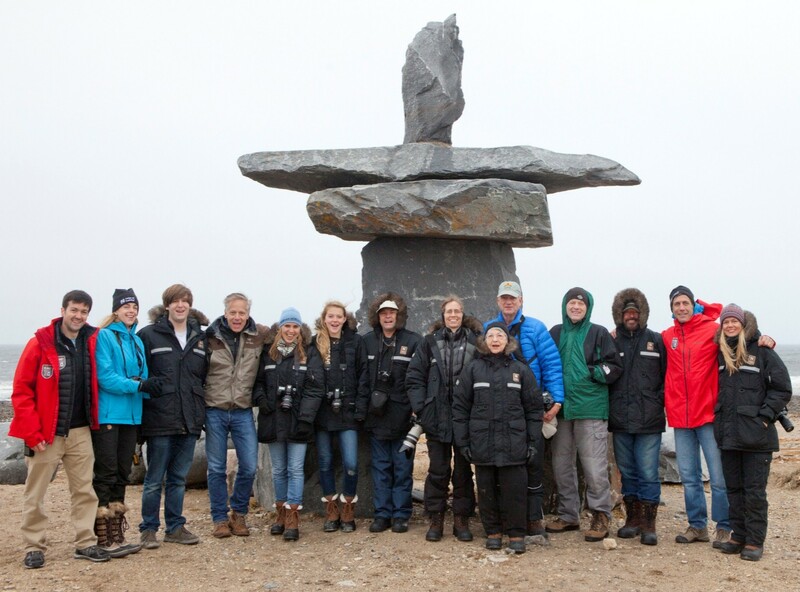 The whole group in front of an inuksuk on the shores of Churchill. But the stars of the show were my old friends, the polar bears. We didn’t see an extraordinary number of them on this trip, but our encounters were wholly memorable: from our first evening on the tundra where we saw one adult male hunkered down out of the wind behind our Tundra Lodge, to our final moments in Churchill when three young males were mock-fighting just a dozen yards from our Polar Rover. Throughout the trip I observed the bears standing at the side of my co-travelers, and I very much enjoyed watching their awe as they witnessed this scene for the first time. But I also took time by myself, on the back of the Rover, to view the bears for a moment alone, appreciating these animals in my own way, knowing that Nat Hab not only makes this experience come true for me on an annual basis, but also knowing that our commitment helps to protect these animals through authentic ecotourism. Now, back in Boulder and enjoying the many letters and emails from our guests who got to see the bears for themselves this year, I can once again share with them the magical emotions of experiencing the polar bears as they live, wild and free. I really do love polar bears!